1954 Ford Convertible owned and restyled by James "Jim" Logue of Long Beach, California. Named "The Fabulous X54," Jim's Ford is known as one of the first cars that used hydraulic lifts to alter the ground clearance. By pressing a button, the car could be raised or lowered 1-6 inches by utilizing a hydraulic system built from aircraft surplus parts. Jim's Ford is the first known custom car to be fitted with hydraulic lifts on all four corners, and it might be the very first custom to ever to incorporate this groundbreaking modification. Photo by Pat Broilier, courtesy of Jim Logue. Jim got the idea for the hydraulics from a Citroen. Citroen first introduced hydropneumatic suspension in 1954, on the rear suspension of the Traction Avant. The first four-wheel implementation was in the advanced DS in 1955. “Citroen used hydraulics to raise the car and go off-road. It was made to raise, so I did some reverse engineering to make it go low.” Jim thought of hydraulics to make the car practical on the street. A construction photo of the Ford taken in 1958. Jim was driving the car for three years, working on each end of it. After the front and rear ends had been restyled, and the car had been lifted, he decided to cut the roof off. Photo courtesy of Jim Logue, provided by Juan Lopez. Jim holding a cutting torch, working on the Ford in 1958. Jim’s dad had a brand new 1957 Ford Ranchero, and after he had cut the roof off he decided to put a 1957 Ford wraparound windshield on the car. He measured how it would fit on his Ford. It fit well, so he knew he had to do that. “Back in those days I was a young kid without any money, so I got a burned out 1957 Ford convertible. I took the dash, windshield section, and firewall from that car. The paint was all gone, and it was rusty. I didn’t want to cut the windshield, so I ended up sculpturing it into the body. I wanted to keep it as a standard convertible windshield so I wouldn’t run into any problems in case it got messed up. It wasn’t easy to cut the windshields down in those days." Photo courtesy of Jim Logue, provided by Juan Lopez. “Wrought by Hand - Pure craftmanship highlight this once ‘54 business coupe.” Pat Brollier photographed the car for a featured story in Custom Cars Magazine. The photo shoot took place after Jim had been drafted; “My dad did all that because I was in the darn Army! He had a ball showing it off!" October 1, 1958, the date Jim was drafted, the build was completed outside, and he had built front seats for the car from scratch. The story was published nationwide in the February 1959 issue of Custom Cars. “If it wasn’t for my dad, nobody would ever have known anything about my car,” Jim told Sondre Kvipt in 2017. A photo from the Custom Cars photo shoot. The story paid little attention to the hydraulic suspension on the car, and the only text mentioning the groundbreaking innovation is found in a caption under a photo showing the engine compartment: “Large cans are reservoirs for hydraulic lowering device which changes the road clearance with a turn of the dash knob.” The cans weren’t tanks, but that’s where the hydraulic cylinders were hidden inside. Photo by Pat Broilier, provided by Andy Lodi. Jim's father bought the Ford brand new in 1954. A year later he crashed it, and Jim bought the remains so he could turn it into a custom. Jim began the build in 1955 by restyling the front end. The fenders were built in fiberglass. “I bought 1955 Mercury headlight rings. I liked those. I then used grey thick cardboard that I formed after the headlights rings.” The front was then dressed up with a 1955 Cadillac front bumper, a 1956 Cadillac crossbar and 1956 Chevrolet Corvette grille teeth. Photo by Pat Brollier, courtesy of Jim Logue. Each year Jim worked on a separate part of the car. After completing the front end, he began restyling the rear. “I never did a drawing or anything on it. It was all in my head.” The rear portion of the body was a complete hand built one-piece construction with all the seams filled in and Jim extended the fins 12 inches before he fit them with 1956 Lincoln tail lights. He used a 1949 Buick rear bumper in the middle that he fitted with 1956 Lincoln exhaust tips. Photo by Pat Brollier, courtesy of Jim Logue. According to the featured story in Custom Cars February 1959 the two large cans in the engine compartment were reservoirs for the hydraulics. This was not true, in fact they were only covers covering up the hydraulic cylinders. Photo by Pat Broilier. A faded photo of the Ford taken at the National Roadster Show, where the car made its first public appearance in February of 1959. “I built it really for the Oakland Roadster Show. That was a famous show in those days.” Jim won the “Clyde Giraldo Memorial Award” with the car, for contributing the most to the automobile industry. This was the first year the award was given out to tribute the well known Bay Area sports writer Clyde Giraldo. Photo courtesy of Jim Logue. Another photo from the 1959 National Roadster Show.Photo by Rick Amado. Another photo from the 1959 National Roadster Show showing the front of Jim's Ford. Photo by Rick Amado. Jim's Ford can be spotted behind Jerry Angolik's 1955 Ford Thunderbird on the cover of Custom Cars July 1959. The photo used on the cover was taken at the 1959 National Roadster Show. A short story about the car was published in the local Long Beach newspaper right after Jim won the "Clyde Giraldo Memorial Award" at the National Roadster Show. Jim holding a trophy he won with the car at a Santa Monica car show. This photo was taken in 1959 when he was home on leave from the U.S. Army. Photo courtesy of Jim Logue, provided by Juan Lopez. The Fabulous X54 as it was presented in the souvenir program from the 1959 Renegades Rod & Custom Motorama. Jim proudly displaying the trophy he won with the car at the 1959 Renegades Long Beach Motorama. This was one of two shows that Jim took the car to himself while he was home on leave from the US Army. Photo courtesy of Jim Logue, provided by Juan Lopez. Chalo Lafuente did a story about the X-Sonic named “The First Car To Be Lifted” in the premier issue of Technical Low Rider Magazine in 1981. Back then the X-Sonic was known as the world’s first lifted car. Jim displaying some memorabilia from the car that he has kept on to all these years. 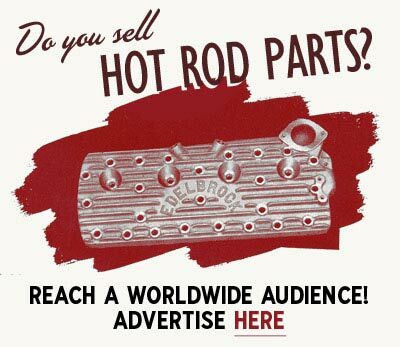 The display sign comes from the 1959 National Roadster Show. Jim was 24 years old when he won the trophies. The recent photo was taken in December of 2017 when Jim was 82 years old. “If I were building the car all over today, I would have run a power steering hydraulic pump so I could raise and lower it off the engine instead of off the battery. That would have been more practical!” Photo courtesy of Juan Lopez. 1954 Ford Convertible owned and restyled by James "Jim" Logue of Long Beach, California. Named "The Fabulous X54," Jim's Ford is known as one of the first cars that used hydraulic lifts to alter the ground clearance. By pressing a button, the car could be raised or lowered 1-6 inches by utilizing a hydraulic system built from aircraft surplus parts. Jim's Ford is the first known custom car to be fitted with hydraulic lifts on all four corners, and it might be the very first custom to ever to incorporate this groundbreaking modification. 20 The First Lifted Custom? Jim was born on October 1st, 1935. He describes himself as a loner with a passion for engineering. Jim grew up in Long Beach, and he got interested in customs after seeing all the cool cars that were parked in front of Barris Kustoms in Lynwood; “George and Sam Barris had a shop in Lynwood, and my parents used to drive by it on Atlantic when I was a kid. We drove by there often, and I told them to slow down so I could see the cars that were parked in front of the shop. The shop was set back, and they had a parking lot in front. When they had finished a build, before the owner came to pick it up, they put the car on display on the parking lot as advertisement. 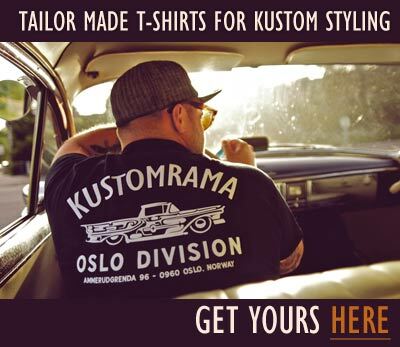 Seeing chopped 1949, 1950 and 1951 Mercurys in front of the Barris shop got me interested in customized cars, and that’s how I got the idea of building my car,” Jim told Sondre Kvipt of Kustomrama in 2018. Each year Jim worked on a separate part of the car. After completing the front end, he began restyling the rear. “I never did a drawing or anything on it. It was all in my head.” The rear portion of the body was a complete hand built one-piece construction with all the seams filled in. “I extended the fins 12 inches to fit 1956 Lincoln tail lights. The fenders were originally curved and rolled in making the back end look narrower, so I ran them out straight. I used a 1949 Buick rear bumper that I cut down in the middle.” Jim fitted the bumper with 1956 Lincoln exhaust tips. The exhaust ran through the trunk, over the wheel wells. “The biggest problem back in those days was that they didn’t have bondo yet. I had to make my own bondo. When I made the fiberglass off the cardboard onto the metal fenders, the problem was when the sun was beating down on it it would show the cloth pattern. It didn’t show right away, but after a period of time.” Jim made his own bondo from the sanding dust from the epoxy and the glass mat. “Then when I went over the whole thing. It didn’t show the cloth pattern. The Corvette didn’t show the cloth pattern because they didn’t use cloth. They used particles that they called matting. The matting is little pieces glass, chopped up and when they fiberglassed over that, you didn’t see the pattern of the cloth. I molded the trunk all in, made the trunk lid lower and used a regular trunk lid. I was then gonna draw a line and cut it all out, but I never got that far. I could still access the rear trunk, but I had to do it from under the tarp that covered where the rear seats should be.” A molded-in continental-kit was installed to dress up the rear end. A 1957 Oldsmobile hubcap spinner was installed on the "Connie Kit". Jim cut the middle of the hood out and lowered it. Then he curved it so he could see over the hood. He put a scoop in the back of the hood that he dressed up with chromed teeth from a 1955 Mercury. “I made my own hinges because the hydraulics wouldn’t have worked on a double action hinge. I built the whole cowl section, and you can see that I sculptured it into the body lines. I decided on what I was going to use, but then I had to make it work.” Jim also rebuilt the engine in the car. It was the first engine he rebuilt himself, and it was hopped up with a three-carb intake manifold. The car was built with intentions of displaying it at the Oakland Roadster Show in February of 1959. “Once I cut the roof off I had to get going in order to complete it for the show. Then I got drafted into the service. They drafted me the day before my birthday, October 1, 1958. I was 22, and in those days they didn’t draft you if you were 23, but they got me the day before I turned 23,” Jim chuckled. When Jim was drafted, the build was completed outside, and he had built front seats for the car from scratch. After Jim lowered the windshield, he had to shorten the steering. If he didn’t shorten the steering, the steering wheel would have been at the top of the windshield. With the shortened steering, a regular bench seat would have hit the bottom of the steering wheel and there would have been no room for legs. “I built the seats from scratch because I wanted them down on the floor. I was long legged and tall, and a regular bench seat would have been way too high for me. In those days the only cars that had those kinds of bucket seats were the Corvettes and the Thunderbirds. That’s where I got the idea for the seats. I didn’t have time to do the backseats. My dad upholstered furniture, so he upholstered the car for me. I painted it, and I did everything except for the seats. I really wanted to do the seats too, cover em, but I didn’t have the time trying to get the car painted and all that stuff.” The seats were upholstered in white and gold Boltavex material. The Fabulous X54 was only displayed at four shows after Jim completed the build, and if it weren’t for his dad, the story about what might be the world’s first hydraulic lifted custom would probably never have been known. “The army really screwed me up, so I was lucky that I could get it together enough for the National Roadster Show. It was a lot of hard work, but I had fun doing it! If I were building the car all over today, I would have run a power steering hydraulic pump so I could raise and lower it off the engine instead of off the battery. That would have been more practical!” Jim believes his car was the first hydraulic lifted car built to be lowered, not raised. “I don’t know anyone else that did it before me, but I don’t think much about it. Somebody once mentioned a Corvette, but I don’t know what Corvette it was or when he did it. Somebody told me that he just did the front end. I wanted to do all four corners so that I could lower the whole car. Run the back up separate. Run it in a rake. Reverse it, or do anything I wanted to. I think I was the first. Before lowriding was a Mexican thing, it was actually a Southern California American thing. Barris did it when I was a kid. Lowering cars, heating the springs!” Ron Aguirre claimed that he had lifts from a Port-A-Power tool installed on the front end of the X-Sonic Corvette at least by October of 1958. Jim’s Ford was mostly completed by October 1, 1958, and the lifts were on the car before Jim cut the roof off and fitted it with a 1957 Ford windshield. Busy with his seven children, Andy decided to pass on the project in 2015, and he sold it to Bryan Robinson of Bellflower, California. Bryan runs Bellflower House of Style, a custom paint and art store focusing on the old school style of customs from the 1950s and the 1960s. 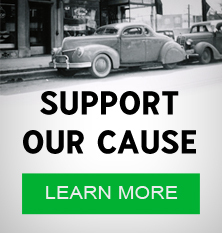 In 2019 Bryan told Sondre Kvipt that he wants to do a complete restoration of the car, restoring it back to how it appeared when it was first built in 1958. “It is still complete and untouched. I have three of the original tires with tubes, and all hydraulics are there as built in 1957.” If everything goes as planned, Bryan will start the restoration in 2019. 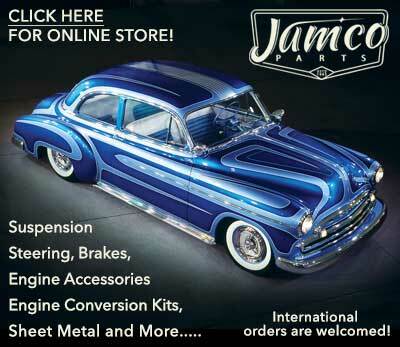 Subscribe to our newsletter and receive updates on Jim Logue's 1954 Ford and other subjects featured on Kustomrama. If you have additional information, photos, feedback or corrections about Jim Logue's 1954 Ford, please get in touch with Kustomrama at: mail@kustomrama.com. This page was last edited on 10 April 2019, at 22:53.